Army Leaders' Manual for Combat Stress Control (FM 22-51) - This field manual (FM) provides information for all leaders and staff on the control of combat stressors and the prevention of stress casualties. Army Medical Department (AMEDD) - Provides an introduction to the U.S. Army Medical Department's headquarters organizations, which are the Office of the Army Surgeon General and U.S. Army Medical Command headquarters. Cover-up of Gulf War Syndrome: A Question of National Integrity - Written by H. Lindsey Arison III, evidence, conclusions, and reasons for the cover-up. 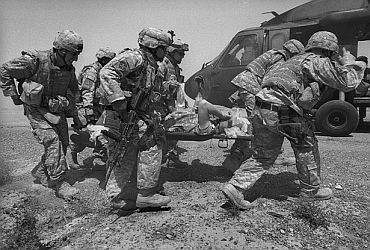 Declassified Gulf War Illness Records - In March 1995, the Deputy Secretary of Defense ordered expansion of DoD declassification efforts to identify all DoD records in the operational, medical, and intelligence communities that could relate to the possible causes of health problems being experienced by Persian Gulf veterans. Force Health Protection and Readiness (FHP&R) - The Deputy Assistant Secretary of Defense (DASD) for Force Health Protection and Readiness (FHP&R) is the principal staff assistant and advisor to the Assistant Secretary of Defense (Health Affairs) for all medically related Department of Defense policies, programs, and activities. The office is responsible for deployment medicine, force health protection, medical readiness, international health agreements, deployment related health policy, theater information systems, humanitarian and health missions, and national disaster support. Department of Veterans Affairs (VA) - Information on VA programs, veterans benefits, VA facilities worldwide, and VA medical automation software. Also, provides related links. GulfBLINK - Gulf War veterans' version of the U.S. government's Gulflink propaganda site concerning Gulf War Illnesses. Landstuhl Regional Medical Center (LRMC), Germany - The largest American hospital outside of the United States and the only American tertiary hospital in Europe. The LRMC provides primary and tertiary care, hospitalization, and treatment for more than 52,000 American military personnel and their families within the center's boundaries and specialized care for the more than 250,000 additional American military personnel and their families in the European Theater. Madigan Army Medical Center (WRMC) - With a beneficiary population exceeding 350,000 within a six-state region, Madigan Army Medical Center continues to be one of the busiest hospital in the Pacific Northwest. Occupying more than 120 acres of land, this four-building structure is located at Fort Lewis in Tacoma, Wash.
Mesothelioma Veterans Center - Providse information and assistance to veterans regarding treatment, clinical trials, and VA benefits for veterans suffering from asbestos illnesses. National Center for Post-Traumatic Stress Disorder (PTSD) - Created within the Department of Veterans Affairs to advance the clinical care of America's veterans through research, education, and training in the science, diagnosis, and treatment of PTSD and stress-related disorders. National Naval Medical Center Bethesda, Maryland - One of the 10 largest medical facilities in the U.S. A source for primary and specialty care under TRICARE, the Department of Defense Military Health System. Naval Medical Center, San Diego - Largest and most comprehensive military healthcare system in the Western United States. Navy Medicine - Provides health care to 700,000 active duty Navy and Marine Corps members, to 2.6 million active duty, retired and family members at a little more than half the national per capita average cost while supporting contingency, humanitarian and joint operations around the world. Textbooks of Military Medicine - A comprehensive, multivolume treatise on the art and science of military medicine. TRICARE - TRICARE is the Department of Defense's worldwide health care program for active duty and retired uniformed services members and their families. U.S. Army Aeromedical Research Laboratory (USAARL) - Conducts research and development on health hazards of Army aviation, tactical combat vehicles, selected weapons systems, and airborne operations. Assesses health hazards from noise, acceleration, impact, and visual demands of these systems and defines measures to offset hazards. Also assesses stress and fatigue in personal operating aviation systems and develops countermeasures. Uranium Medical Research Center - Independent research group providing analysis for depleted uranium exposed individuals and populations. VA Benefits for Mesothelioma - Too many veterans assume that because they served in the military decades ago, that they are not entitled to benefits such as disability compensation. However, the truth is that they are not only eligible, but most likely qualify, as long as they can explain to the VA how they were exposed during military service. Virtual Naval Hospital - Military medicine, naval medicine, humanitarian medicine, and disaster medicine textbooks. Walter Reed National Military Medical Center (WRNMMC) - WRNMMC is the Navy's third-largest health care delivery system and provides more than 12,500 ambulatory surgeries and almost 8,000 inpatient admissions each year. As the headquarters for the regional Health Care System, WRNMMC encompasses facilities in five states and the District of Columbia (Northern Virginia, Maryland, Pennsylvania, West Virginia and New Jersey). WRNMMC has treated 1,000s of war wounded service members, including Army, Navy, Marine Corps, and Air Force personnel. This webpage last updated on Thursday, August 4, 2016 9:40 AM.